but I waited to write about it until tonight. On Monday night, my daughter and I joined 300 other people for a conversation on race and racism in the Belk Chapel at Queens University here in Charlotte. It was hosted by Mecklenberg Ministries (www.meckmin.org) as the first of a series of "Community Conversations for Healing and Change." Here's what was written on the handout: "We Need to Talk...about Charleston, yes, but also about our shared life together in this community. We need to talk about who we are, where we have been, where we want to go, and how we get there. But mainly, we just need to talk. This series is a unique opportunity to speak and be heard in a safe place. Come as you are with something on your mind - things that may be hard to say and hard to hear. The conversation each week will be based on themes, stories and perspectives from our local community, from our nation and, most importantly, from what each person present brings to share." Black people and white people. Muslim, Jewish, Christian and non-religious people. Angry, sad, brokenhearted, courageous, frustrated, outraged and inspiring people. There we were, seated together, standing together, laughing together, groaning together, applauding one another's courage and wisdom. One by one, dozens of people stepped to one of two microphones and shared their insights and feelings and questions and challenges with the audience. They did exactly what the flyer said - they spoke and were heard in a safe place. with perspectives that challenged our own. One beautiful brown skinned mother spoke of the way her daughter is treated at the pool club they are members of. She said that white children swim away from her because "they are taught there's just something not right about not being white." Is that what parents are teaching their children - either by speaking ill of others or by speaking nothing of others? 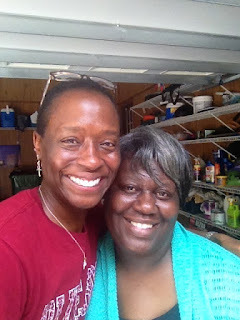 I was encouraged because her words stirred us all to think about how we parent and what we are teaching our children with our words, our actions, and by who is and is not included in our circles of friends and neighbors. Another woman asked the audience why there were so few young people in attendance. Did we leave our children at home watching television and playing video games? Why not bring them to hear the stories and testimonies being shared? Isn't it about time for our children, all of our children to hear what's happening in our country and be in conversation about all that has to change? I was encouraged because parents and teachers and every other adult in the room were reminded of our need to stop protecting our children from hard truths and to start to teach them the hard truths so that together we can make the hard decisions to bring about change in our world. A Rabbi told a funny and profound allegory - Several people are drifting along the water in a boat. One of the people pulls out a drill and begins to drill a whole in the floor of the boat. The others protest. He says, "What are you so upset about? I'm only drilling under my seat." Ouch. We too are allowing others to drill holes in the boat of our nation, our faith traditions, our political system, our health care system, our neighborhoods, our schools, and our environment - just to name a few. Companies that don't care for the planet but only exploit it. Businesses that don't care for their employees or customers but only take advantage of them. Adults who neglect or abuse children. We who ignore the hungry and the imprisoned, the homeless and the lonely - we are all drilling holes under our seats and wondering why we are drowning in sorrow and violence and greed and anger and poverty. We are all in the same boat and we are all working pretty hard to sink it. But I was encouraged because I have a better understanding that every problem around me is my problem. I was encouraged because many of us are waking up to our responsibility to lay down our drills, to patch the holes we have created, and also to rescue folks who have fallen out of the boat and are drowning. I wish there was time to respond to each of the comments, to engage in quiet reflection, to take it all in more thoughtfully. I was encouraged that so many people had so much to share and that the conversations will continue. I know I won't be able to get to all of them, and I hope that many people will attend and that, indeed, the conversations will continue long after the final talk late in August. I am encouraged that there will be safe places to gather to grieve and to hope, to ask questions and to seek answers for the next couple of months - and beyond, I pray. I am encouraged that the shooter's hope for a race war might indeed come to pass - a war against race and racism, a war against hate and fear, a peaceful struggle openly waged against violence. This lovely lady with me is Coretta. Her husband came to our house recently to do some painting. He returned with her yesterday morning to pick up a piece of furniture we were giving away. She is a sister breast kanswer survivor. She also chose a double mastectomy without reconstructive surgery. A flat chested sister. Her kanswer was far more aggressive than mine - but her joy and her courage, her stories of grace and wigs, of prayer and miraculous healing (a spot on her rib cage that literally disappeared without any traditional medical treatment - so miraculous that even the PET scan technician spoke of how amazing it was that the spot was gone) lifted my spirits in ways she cannot imagine. We laughed at one point when she talked about wearing a wig and having to take it off in church because it was giving her a headache. I followed that story with an account of my battles with hot flashes. In true church speak, she said, "Hot flashes were not my portion." I laughed out loud. "Not my portion," I like that way of saying that she didn't suffer with hot flashes. Lucky her - those horrendous power surges most certainly were "my portion" during chemotherapy. I was encouraged by her contagious peace, her victorious spirit, her vivacious personality, her refusal to be shaken by the fact that she didn't have medical insurance while all that was going on. I was encouraged because Love showed up in my garage yesterday morning. Laughter showed up. Tears came, but so did joy. Last night at the service where I was afraid, the front of the sanctuary was a somber sight. Two tables with photographs of The Nine who died in Charleston. 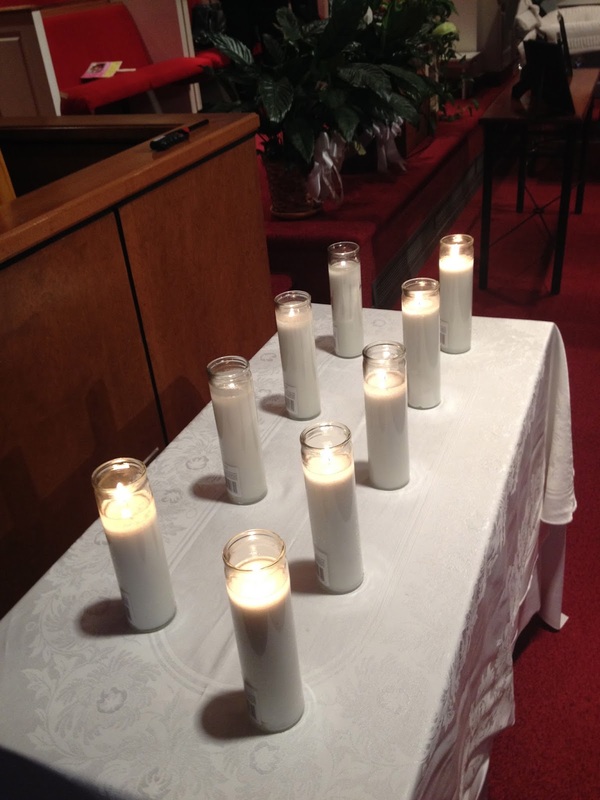 One table with nine candles that were lit during the service. And in the middle - a casket. Open. With a mirror inside it. Because any of us could have been at that church that night. Or our own churches. Or our homes. Or in school. Or walking down the street. Or in our car. Or in a movie theater. Or in the mall. Or on an airplane. Or any of the many presumably safe places where innocent people have been gunned down in this country of ours. We could be in that casket. One day each of us, every one of us will be in a casket. What will we have lived for and died for? I was encouraged as I stood in front of that casket because the brave men and women at last night's service understood and explained the importance of living and dying for justice and righteousness' sake. I know I'm going to die - it may as well be in service to the world, to the community, to my family, to God. This afternoon, I sat with two of the pastors of my church talking about Charleston and what we need to do in response. We talked about anger and fear, about racism and how to counter it, about hope and the future. After one of them left the room, I sat with the other for another hour talking about our church's upcoming fall festival. We brainstormed ways to keep the congregation and the community talking about these difficult issues and incidents when it is far too easy to forget how we feel right now and just get back to "our normal lives." What do we want to say to each other about racism? How do we discuss our fears? What can we do to be people of justice in a world where injustice is the order of the day? What does the church have to offer to a needy and hurting world? I was encouraged because there is much to be done and both the will and the desire to move beyond talking into action. Our church is active in the community, in partnership with two schools, with ministries to those who are living with homelessness, feeding people who are hungry, building projects with Habitat for Humanity - and so much more. I am grateful for what we are already doing. But it is easy to hide from so much of what is going on around us, to deny the existence of institutional racism and injustice, to pretend that we are doing all we can do to combat the problems we choose to address, and when all else fails, we convince ourselves that what we do won't make any difference anyway. I am encouraged because our eyes are open now, perhaps more open than they have been in a long time, to the vast needs of our city and our world. I am encouraged because we are determined to do more and serve more and love more even when we are uncomfortable and afraid. justice is on the march. Righteousness is on the march. Hope, faith, and joy are on the march.